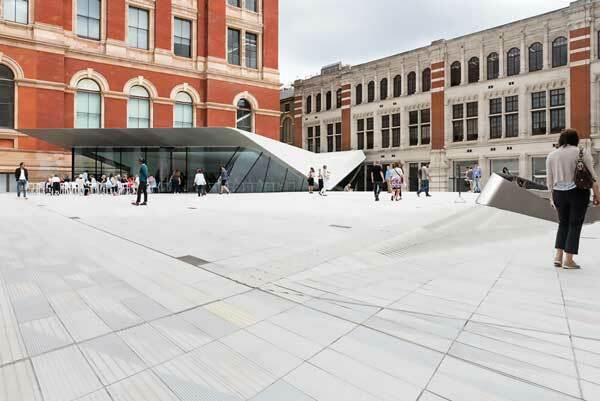 The most significant work undertaken at the V&A museum for over 100 years, this development’s centrepiece provides a large column-free underground exhibition gallery. As the SSDA awards celebrate their 50th year of recognising the best of what the UK steel construction industry can achieve, we celebrate that 77% of the projects feature STRUMIS customers. In this post we will be celebrating Bourne Steel Ltd.’s involvement in the V&A’s Exhibition Road Quarter project. This development at the V&A’s South Kensington campus provides not just a large column-free underground exhibition gallery with an oculus to allow the influx of natural daylight, but also an open courtyard and a significantly improved street level entrance from Exhibition Road into the museum. Known as the Sainsbury Gallery, the new 1,100m² column-free space is one of the largest temporary exhibition spaces in the UK and allows the V&A to significantly improve the way it designs and presents its world-class exhibition programme. Following an international competition, AL_A, working with Arup, were appointed as the designers of this scheme. Key to their success in the competition was the use of structural steelwork for the concept design of the folded plate roof. This consists of a system of 13 triangular secondary steel trusses, which span from one large 45m-long primary truss across the gallery, supporting the courtyard, cafe, and crucially allowing the changes of existing ground levels to be fully exploited to fit in a mezzanine floor. Early engagement by Arup with steelwork contractor Bourne Steel during the design process meant that the design moved from one needing extensive temporary support, to one where the trusses were self-stable, making the erection process much easier. Bourne Steel was responsible for the connection design, fabrication and erection of the steelwork, including the 13 triangular trusses, which each measure up to 25m in length and weighing up to 14t.